SCOTTSDALE, Ariz., Jan. 11, 2018 /PRNewswire/ -- The Edison Electric Institute (EEI) presented DTE Energy with the association's "Emergency Recovery Award" on Wednesday for its outstanding power restoration efforts after tropical storm-force winds hit Southeast Michigan in March 2017. The award is presented to recognize energy companies' extraordinary efforts to restore power to customers after service disruptions caused by severe weather conditions or other natural events. The winners were chosen by a panel of judges following an international nomination process, and the awards were presented during EEI's Winter Board and Chief Executives Meeting in Scottsdale. On March 8, 2017, Southeast Michigan experienced six hours of wind gusts greater than 60 mph, resulting in extensive damage to the region's energy system. The storm, which was the largest weather event in DTE's history, impacted nearly 800,000 customers. Crews from DTE Energy restored service to more than 90 percent of customers in four days, dedicating 660,000 man-hours to restoration efforts. Energy companies from seven other states sent crews to Michigan to help with the efforts as well. "The tireless work by DTE Energy crews during the severe windstorm in March exemplifies our industry's commitment to customer service," said EEI President Tom Kuhn. "DTE Energy's crews worked diligently to safely restore service to customers, and are very deserving of this award." "While we faced many obstacles during this catastrophic event, our employees made me extremely proud because they responded to the challenge with tireless energy," said Gerry Anderson, DTE Energy chairman and CEO. "We know the outages caused by the storm created hardship for many of our customers, and that is why our employees worked around the clock until the last customer was restored. Thank you to EEI for recognizing this historic effort." 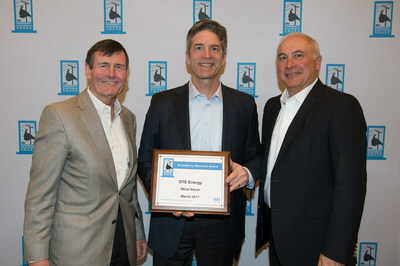 Tom Kuhn, EEI president (left) presents award to Gerry Anderson, DTE Energy chairman and CEO (center) and Jerry Norcia, DTE Energy president and COO (right).